Lithuania, officially the Republic of Lithuania is a country in northern Europe. 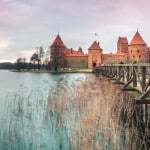 One of the 3 Baltic states, it is located at the southeastern shore of the Baltic Sea. It shares borders with Latvia to the north, Belarus to the east and south, Poland to the south, and Kaliningrad Oblast to the south-west. Lithuania has an estimated population of 3 million. The country’s capital and largest city is Vilnius with a population of almost 550,000 residents. Lithuania’s official language is Lithuanian. A little more than 77% of the population is Roman Catholic. Lithuania is amongst the fastest growing economies in the EU and ranks very high in the Human Development Index (HDI). In 2015, the country adopted the Euro as the official currency becoming the 19th member of the Eurozone. Land-based casino gambling is legal in Lithuania since 2001. There are numerous establishments throughout the country offering the most popular games like roulette, poker, blackjack and slots. Online gambling is legal too, however, a local gambling licence is still required. Bingo is legal but not very popular in Lithuania. There aren’t any bingo halls in Lithuania currently. Online bingo is illegal, as long as the provider has a local gambling licence. Poker is quite possibly the most popular card game of all time. You can find poker tables in most of the land-based casinos in Lithuania. A recently issued law prohibits online gambling providers from operating without a local licence. This applies to poker websites as well. Lithuania’s national sport is basketball. The Lithuania men’s basketball team had significant success in basketball tournaments as they won the EuroBasket in 3 occasions and earned 8 other medals in EuroBasket, World Championships, and the Olympic Games. Lithuania produced a number of NBA players too. Sports betting, betting on basketball is quite popular in the country. Betting on sports is legal in betting shops and online provided the company has a local gambling licence. In accordance with the 2003 Law on Lotteries*, lotteries are not a state monopoly in Lithuania. Lithuania’s biggest lottery is issued by Olifeja Inc. The company offers many kinds of lotteries and lottery type games like Teletoto, Keno and scratchcards to name a few. Even tough purchasing lottery tickets is legal in Lithuania, the company does not have an online gaming presence yet. Foreign lotteries and lottery agents are also available to Lithuanian players. The Bank of Lithuania issued a statement in 2014 that Bitcoin is not recognized as a legal tender in the country. As of now, there isn’t more information about Bitcoin gambling in Lithuania. No Bitcoin only casino has applied for a license in Lithuania since then. If Bitcoin is not recognized as a legal tender, then online gambling using Bitcoin is not considered gambling at all. If that’s true, even Bitcoin casinos without a license can be legally accessed by Lithuanians. But this is only speculation at this point, as soon as we hear more about this we will update the website. An overview of the legal status of gambling and online gambling in Lithuania. Great article. I was intrigued by the fact that Bitcoin was not recognised as a legal tender in the country, and that would make it possible for pure Bitcoin casinos to target Lithuanians, since gambling using bitcoins would not technically fall under the gambling license laws. I would imagine a lot of Bitcoin casinos would take advantage of this loophole. It would also be very hard for any Government to track if Lithuanians gambled at Bitcoin casinos as these casinos don’t require you to provide any personal details upon registrations. I’m looking forward to see how this develops.